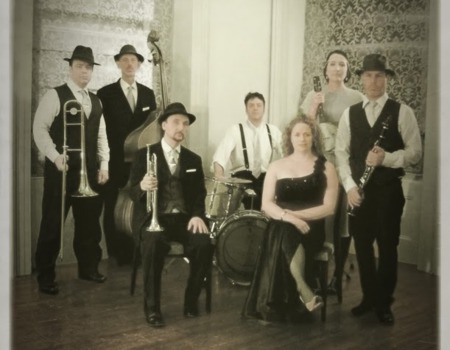 The Silver Ghosts are a London based seven piece swing ensemble (trumpet, trombone, clarinet, banjo, double bass, drums, vocals) performing numbers that evoke the hot, breathless and high spirited dance gigs of the 1920s, 30s and 40s. Remaining faithful to the smart sartorial spirit of the period of the music, their look is considered an important part of the ensemble's performance. The dapper band has performed at renowned jazz venues and swing dance club nights all over London. Some of them even know a few period partner dance moves and are liable to swing out on the dance floor for the Charleston or Lindy Hop! Founder member Mark Aguera (trumpet/piano) had been inspired by the energy and style of several swing dance club nights around town where the DJs play nothing but antique 78s on period equipment modified for modern speakers, while passionate patrons dance to riotious, hedonistic music from that heroic era. Over subsequent months the outfit settled as a seven piece ensemble, gigging at swing dance club nights and hallowed jazz venues all over town.